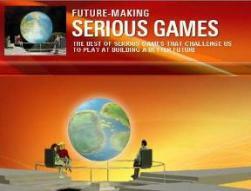 Via: NanoMission - 3 Games Modules Available For Download! 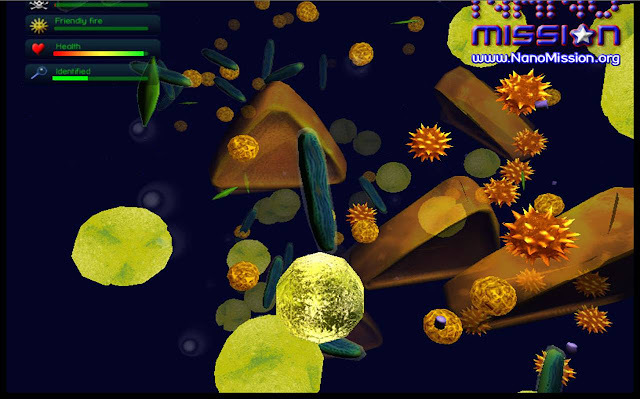 Following my prior post Serious Games To Understand Nanotech, PlayGen has made 3 game modules available for download: NanoMedicine, NanoScaling and Nano Imaging. Whilst most young people are familiar with nanotechnology as a fantastic futuristic technology involving miniature robots, very few have a realistic understanding of nanotechnology, realise its impact on the world around them, or are genuinely stimulated about its possibilities. 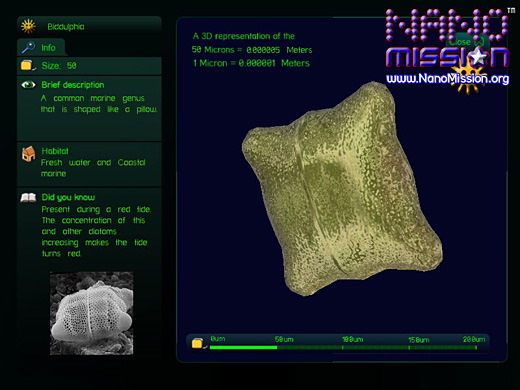 NanoMission is an interactive 3d learning game based on understanding nano-sciences and nanotechnology. 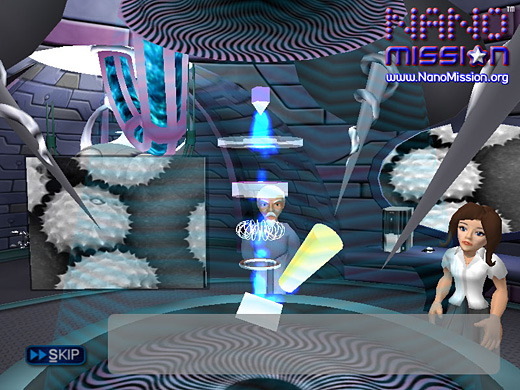 The players are challenged in imaginative environments that promote learning about: Molecular building, Nano-Imaging, Creation of Nano-devices, Nano-medicine, Quantum Behaviour, Manipulating Electrons and Nano-Materials. The key factor in the project is a firm grounding in real scientific facts and knowledge played out in an imaginative and exciting game world. 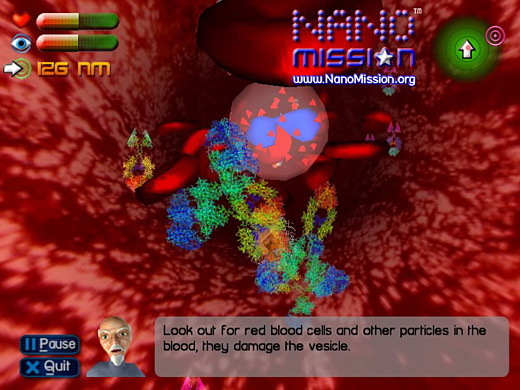 As a result of close interactions with the scientific community, the game provides accurate three dimensional view of the nanoworld. In order to make the game available to as many teachers and young people as possible, PlayGen is seeking sponsorship to cover development costs. 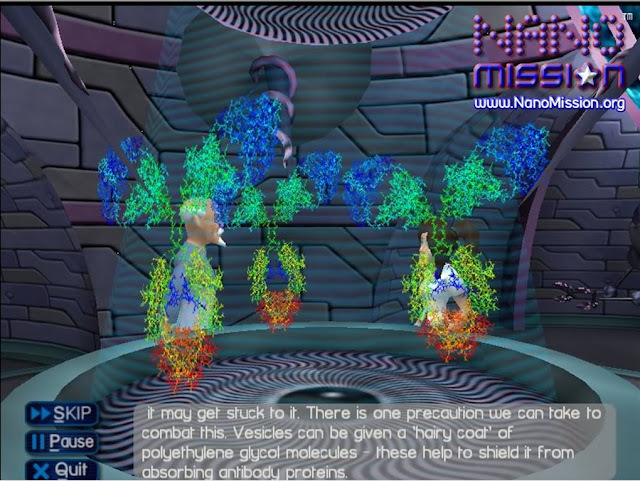 The game's plot is to save the world from destruction by Dr.Nevil and his army of nano-machines and nano-materials, whilst the player stealthily learns about real world nanotechnology. 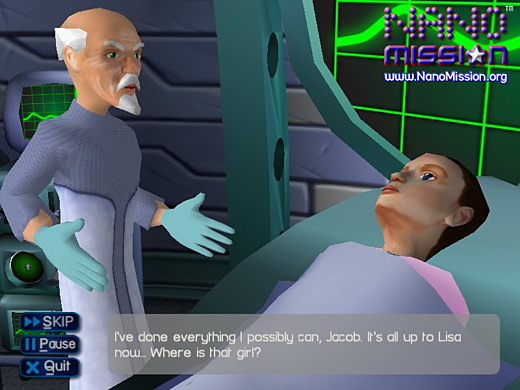 NanoImaging Module : Dr Goodlove and Lisa are in the science lab, as Lisa explains a serious environmental disaster heading to all fresh water lakes in the world. Dr Goodlove suspects extremely small organisms created by Dr Neevil are to blame and explains how a Scanning Electron Microscope can be used to identify them. The genetically modified algae is manifesting in huge blooms turning lakes red, toxic and fatal to humans and animals. Your mission is to identify this evil in-order to develop a counter measure and save the world. 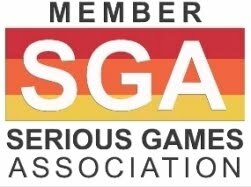 Learning Scale Module : The NanoMission scaling module enables the players to visualise and understand the spatial relationships between objects at all scales from the pico-meters through nano-meters all the way up to giga-meters. Using the 3d environment the player can scroll back and forth through a wide range of familiar and interesting objects, from a single hydrogen atom all the way up to the Sun. 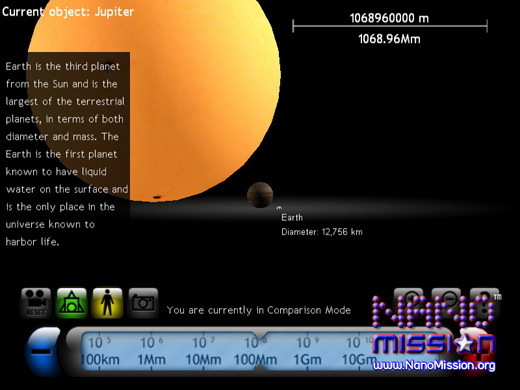 Information about the objects and visual measurement references are provided, as is also a Character mode where the player can change their size to be the same as the current object’s and walk around to compare themselves with other objects of various sizes. 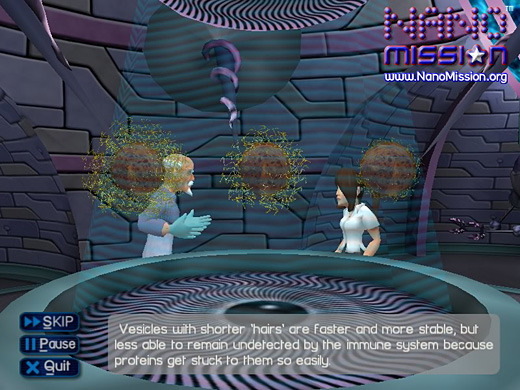 NanoMedicing Module : Join Dr Goodlove and Lisa in the demo of the first module, nanomedicine, select a suitable vehicle to deliver an anti cancer compound, and then navigate through the bloodstream to the site of the tumour, avoiding the body's natural defence mechanisms. Nano Medicine: How nanotechnology can be used to help fight disease. Nano Scale : What the nano scale is like from a first person point of view & how it differs from normal scale. Nano Imaging: Imaging at nano scale. Use of atomic force microscope, electron microscopes and scanning tunnelling microscope. Nano Manipulations: Modifying and manipulating atoms inside nano structures. Nano Electronics: How nanotechnology is used in electronics. Nano Machines: Devices created from atoms. Nano robots, nano sensors, nano motors, nano drug delivery systems, nano manipulators. Self-Assembly: Understanding self-assembly in the nanoworld. Quantum Theory and Quantum Computing : How objects behave at quantum level, wave particle duality, uncertainty principles, applications in quantum computing. Nano Materials : How tho create them and what are their properties.